Wine. Yes, It Is Good. March 08, 2013 • Heidi Shenk • "cuisine" • "food"
I like wine. I drink a lot of it. Andrew told me that if I quit my day job and did design full time that I might have to cut back on my wine consumption. I told him that I'd figure it out and that I would still enjoy my wine, thank you very much. Either way, I thought it'd be fun to share with you all what I've been drinking lately. I'm definitely no wine expert. Ask me about aroma, tannins, legs, or all that other crap and I'll probably look at you like you're crazy. I honestly have not a clue. However, I do know that these bottles of wine are pretty damn good and will end up in my cart every time I stock up again. The Bonterra is on the pricier end for me at $15. I try to go for anything between $8 and $12. That being said, I've had a lot of bad wines at that price, but I've also had a lot of good ones and these have definitely stood the test for tasty. The La Posta is the one I will always have on hand. When we stock up, I usually snag a few bottles in case we're headed to a friend's house and we need to bring a bottle of wine. The Stump Jump has become a new favorite that is reasonably priced-- not bad and nothing super extraordinary, but you can't really go wrong. It's a no-brainer. Do you enjoy drinking wine? I like to grab a glass to drink while I'm cooking and then enjoy a little more with my meal. Hope you're able to find these at one of your local wine sellers. And if you do, let me know what you think! April 02, 2012 • Heidi Shenk • "cuisine" • "food" • "recipe"
For those of you that missed me the last few days, I am officially back! I took a quick trip up to New Jersey and New York City to visit a friend and attend a bridal shower of another friend. 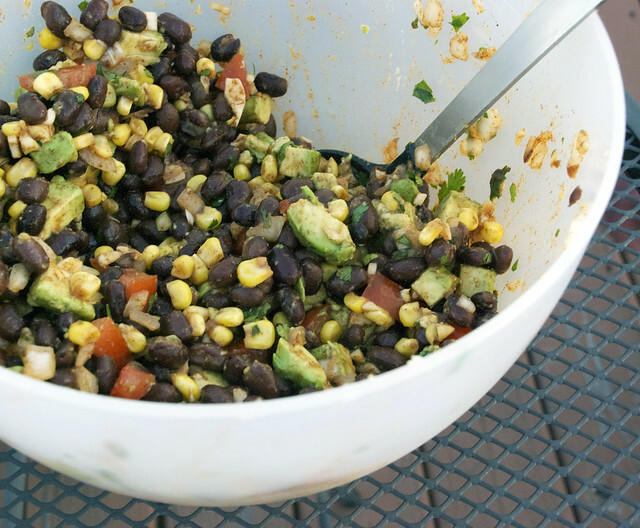 I had promised that later last week I would share the recipe to my black bean salad that so many of you requested. Obviously, I failed tremendously at getting it posted later that week. A busy week leading up to Spring Break plus our quick trip all led to me having no time. So what better way to get back to my blog than to finally share this recipe you've all been waiting for. And I can also now officially say that I'm on Spring Break for the entire week! Woohoo! Combine and toss ingredients, adding avocado and tomato right before serving. Serve with tortilla chips. This is one of the most simple, yet flavorful recipes that I've made. I absolutely love making this when we have barbeques or backyard parties in the summer. It is perfect for a quick snack as well. The flavors really set in even more so by the second day, so I often quickly make it the night before I plan on eating it. March 28, 2012 • Heidi Shenk • "cuisine" • "recipe"
I'm not one that usually needs meat in my life, but Andrew is part Irish, part English, and grew up with meat and potatoes on a regular basis. Aiming to please once in a while, and wanting to try something new, I decided to go the meat and potatoes route the other night. This beef tenderloin, accompanied by potato risotto, is a recipe that worked perfectly for a Friday date night at home. 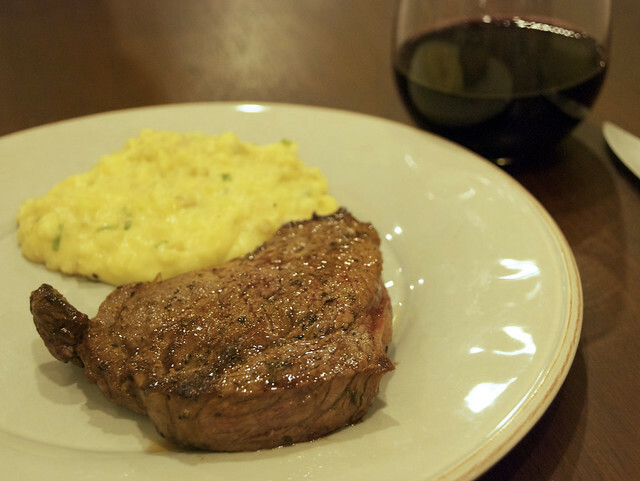 The tenderloin was seasoned just perfectly, and the potato risotto was rich and creamy-- a perfect side that I'll be sure to use with other meals. Want to have a go at this delicious (and fairly simple) gourmet dinner? I'm happily passing on the recipe below. Melt butter with the onion in a large deep sauce pan. Cook the onion, stirring occasionally, until the onions are clear. Add the cubed potatoes and cayenne pepper, and sprinkle with salt and pepper. Add the chicken broth and bring to a boil. Reduce the burner to medium heat and simmer until the potatoes are almost tender (about 8 minutes). Add cream and continue to simmer for about another 10 minutes. At this point, the potatoes will begin to hold their shape. You'll want to continue stirring the potatoes so they do not stick to the pan. Finally, stir in chives and the Parmesan cheese. Sprinkle coarse salt, pepper, and thyme on both sides of the steak. Rub the spices into each side of the steak. Heat the olive oil in a skillet on a medium-high burner. When the oil is heated, add the steaks and cook until they are done as desired. I found that for a medium steak, each side needed 4-5 minutes. This meal went fabulously with a red glass of wine and the best chocolate cake ever. We enjoyed a bottle of La Posta Cocina Malbec with the meal which ended up being the perfect pairing! What have you been cooking up in the kitchen lately? March 25, 2012 • Heidi Shenk • "cuisine" • "food" • "Lilah"
What better way to enjoy a Friday evening at home on the roof top deck with your own little happy hour. While it's fun to meet up with friends after a long work week, sometimes it's more enjoyable to kick back and relax. And that is just what we did this weekend. On the menu was homemade crostini and crab dip, a black bean salad with tortilla chips, and a couple of home brews. A pup by our side and a chance to enjoy the sunset over Baltimore City made this may favorite part of our weekend. March 21, 2012 • Heidi Shenk • "cuisine" • "food" • "recipe"
When I was in high school, I used to bake desserts for the coffee shop in my hometown called The Electric Brew. I would spend the day at school and the afternoons and early evenings baking. In that time, I baked hundreds of cookies, muffins, cakes, quick breads, brownies, and other assorted things. And I got pretty good at it. I had a lot of experience going into it all considering that my mom is a baker and owns the best European-style break bakery in the area (I'm not being biased!) called Rachel's Bread. I asked Andrew last week if there was anything in particular that he wanted to eat for dinner this week, and his response was just, "Desserts. You make the best desserts." So on a quest to come through for him, and with the excitement of getting back to what I'm truly the best at in the kitchen, I scoured the web for a new recipe to try. And what I found was the most delectable chocolate cake I think I've ever had. Mind you, it may be incredibly rich and take a bit of time to make, but in the end, I guarantee it is all worth it! Pre-heat the oven to 350. In a stand-up mixer, cream sugars and butter until nice and fluffy. Beat in eggs one at a time. Incorporate chocolate and vanilla until smooth. Combine flour, cocoa, baking soda, and salt in a separate bowl. Mix in flour mixture and buttermilk alternately. Pour the batter into 2 greased, round cake pans and bake 25-35 minutes or until a toothpick comes out clean. Let cakes cool in the cake pans for about 10 minutes and finally invert the cakes onto a wire rack. Begin heating the milk until hot, but not boiling in a small quart-sized saucepan. In a bowl, combine egg yolks, flour, and 1/3 cup confectioners sugar along with a pinch of salt. Pour milk into egg mixture and whisk continually. Put mixture back into the sauce pan and bring it to a low boil while continually whisking. Reduce the heat and continue whisking until the mixture becomes a thick custard. Transfer the mixture to a large mixing bowl and let cool for 45 minutes to an hour. Once cooled, add vanilla and remaining amount of confectioners sugar and mix well. Beat in softened butter until smooth and creamy. Finally, pour in melted chocolate and beat the frosting until nice and airy. Using a serrated knife, cut each cake into two horizontal layers. Use about 1/2 cup to 3/4 cup of frosting between each layer and then use the remaining frosting for the top and sides of the cake. The cake turned out very light, moist, and fluffy, yet extremely rich. We enjoyed a piece of cake along with some of our homemade mint liqueur. This is most definitely not your every day cake and would be perfect for a special occasion or surprise. Needless to say, this must be the best chocolate cake that I've made to date, and would highly recommend trying it! Do you have any special dessert recipes that you'd like to share? I would love to try them!